An understanding of the basics of cotton yarn in textile production. Cotton fiber is a thread-like substance, called “Staple". Grown in warm drier climates, cotton requires 4-5 months of 60°F - 86°F weather. Although the textile industry has migrated east, The U.S. cotton industry still thrives, ranking third behind China and India. The length of staples determines the quality of cotton. The higher the length, the better the cotton is. Staple length can vary from .375” to 2.25” depending on variety and growing location (temperature, fertility, and water stress all affect the length of the staple). Sea Island Cotton - it is the best quality of cotton in the world and it has the longest staple of 2.25”. Sea Island Cotton is mainly grown in South Carolina, Georgia, Florida and islands off the coast of these states. Sea Island Cotton is frost-sensitive and thrives in tropical areas with high humidity. Pima Cotton – is related to Sea Island and Egyptian cotton adapted to grow in more arid climates through a partnership between the U.S. Department of Agriculture and Pima Tribe Native Americans. USDA named the cotton after the Pima Tribe to honor the collaboration. Asian Cotton – is grown in Asia like India, Pakistan, Japan, and China. The most common variety of cotton with a maximum staple length of 1.125”. The thickness of the cotton staple is the other determinant of cotton quality. Finer longer staples yield higher quality yarn as slim long staples can be spun together to create finer, stronger cloth. You must prepare the staples for spinning into yarn by removing foreign objects, separating usable staples, and aligning the remaining staples. The resultant "sliver" is achieved through a process of combing or carding. Higher quality staples are 'combed' through a series of metal teeth that lay the staples parallel to each other. This is a more expensive process as combing cotton will save only the finer, long staples for processing. Shorter staple cotton must be carded (to survive the process). Cards with wire teeth are used to separate the staples from the detritus however they are not laid parallel. Cotton uses a unique measurement system to classify yarn quality. You'll see numbers like 10/1, 16/1, 20/2 e.t.c., but what are they? and how they are determined? If you take 1 strand of yarn of and 840 YDS (1 YD = 0.9144 Meter) of same and if this 840 yds weigh 1 lb, then we can call this 1s yarn. While seemingly a random number, 840 yards is the distance that 1s cotton occupies to weigh 1Bb, therefore all other measurements must use 840 yards and 1Lb as controls. For example, take 2 strands of yarn each 840 yds in length and both together weigh 1lb, then we call this 2s yarn. Twice the yarn weighs the same. As mentioned, the finer the yarn, the better quality the textile. Theoretically in the textile industry, one can make yarn from 4 count to 120 count. The higher the number of counts the finer the yarn is. 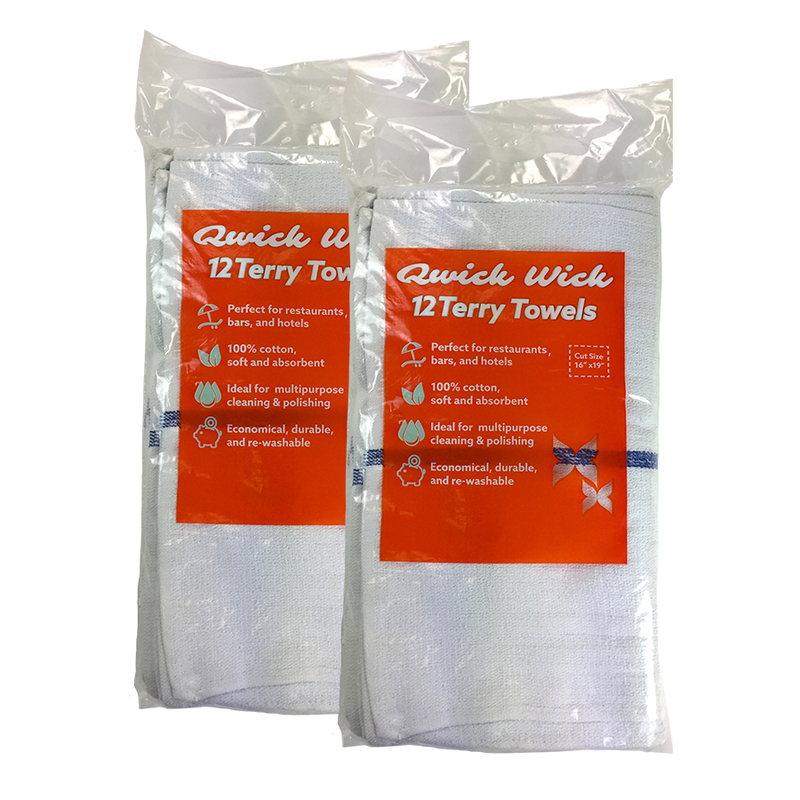 Normally in towel business we work with 10S up to 30s with 12s and 16s being the most common. Higher numbers are usually used for making finer fabrics. Single yarns are twisted using a mechanical process to make it stronger. For example if 2 10s yarns are twisted together it will make a 10/2 yarn. You can use the fraction to determine what thickness it would be as a single yarn 10/2 = 5/1. However, the strength of the yarn will be higher as the cotton is wound together (similar to the internal suspension cables in a bridge). The yarn will also feel finer because it uses longer staple cotton. The ground consists of warp (purple) and weft (blue) which provide structure and strength. Cotton pile (yellow) absorbs moisture and gives the towel body and softness. Pile yarn is what people feel when using a towel to dry their body. So single and finer count yarn is used in the pile whereas weft and warp yarn are used to make the base and weave strong. Weft is a single yarn whereas ground yarn is mostly a double yarn for better strength. Sometimes blended (50/50 Cotton/Poly) yarn us used in the ground for institutional towels to fortify the towel's strength so that it can be laundered more often (thus extending the lifecycle and lowering the linen budget). A well balanced institutional towel will follow similar ratios to balance lifecycle and cost. Warp Yarn 23-22% -10/2 - 20/2 cotton yarn (the warp must be doubled for strength). In terry towel production coarser yarn (count) is used. Whereas other textiles like bed sheets and clothing use a higher yarn count - 50/1, 60/1 and even 100/1 depending on what kind of the desired fabric quality. 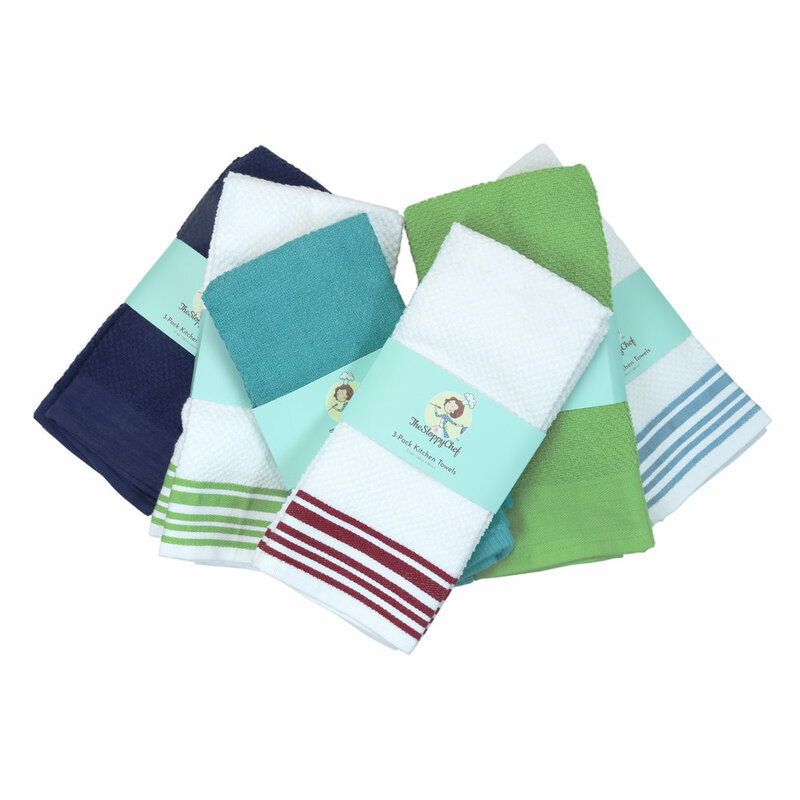 Retail towels use 100% cotton yarn special fibers like Modal & Bamboo fiber may be incorporated to give the towel a softer, more plush look and feel. Special fibers are more costly which makes them unsuitable for institutional textile use. Most retailers use a higher yarn, better quality yarn count to make their towels softer (E.g. 30s Pima Cotton). How do I stop my wholesale table linen from fading? Restauranteurs will tell you that the table setting is the gateway to a memorable restaurant experience. Before the menus, still or sparkling water, cocktails, and amuse bouche, a table setting alone holds court. Recently I visited a laundry prospect and saw something that would make restauranteurs break out in cold sweats. After the table linen came out of the dryer two workers diligently sorted it into boxes of various shades of grey. The owner told me that they do this so the colors match when packaging them for restaurants. Nobody likes a patchwork of 50 shades of grey; it makes the restaurant look tatty. We had a better solution. Which Is Better, Cotton or Spun Poly? For the purpose of this article, we'll be exploring spun poly, as it is the most common fabric used in commercial restaurants. Yes, cotton feels soft and more natural than spun poly. However, spun poly (a plastic) is wrinkle-free, stain resistant, holds color better, will not shrink, and will last twice as long. Polyester was developed in 1941 to help the British war effort. Cotton does not grow in England so was hard to come by. Polyester was developed to be woven like cotton. the new fabric was wrinkle-free, stain resistant, held color better, did not shrink, lasted twice as long, and ensured Britain had pants to finish the war. Polyester is made by combining multiple (Poly) organic and inorganic compounds (Esters) in ways we don't really understand (we're textile experts, not chemists). The resultant compound is then extruded from a showerhead* to form monofilament strands (think fishing line). 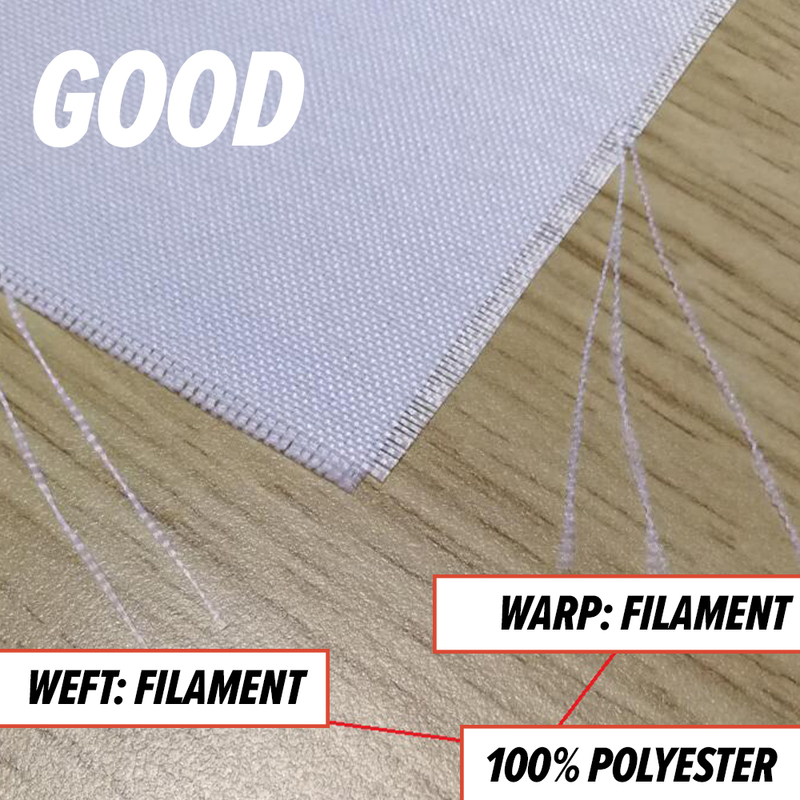 From monofilament thread, spun poly yarn and filament poly yarn are created. What's the difference between Spun Poly and Filament Yarn? Think of spun poly yarn as "ring spun yarn". Multiple strands of monofilament are 'spun' together to form a tightly wound yarn that may be treated for softness without sacrificing strength. 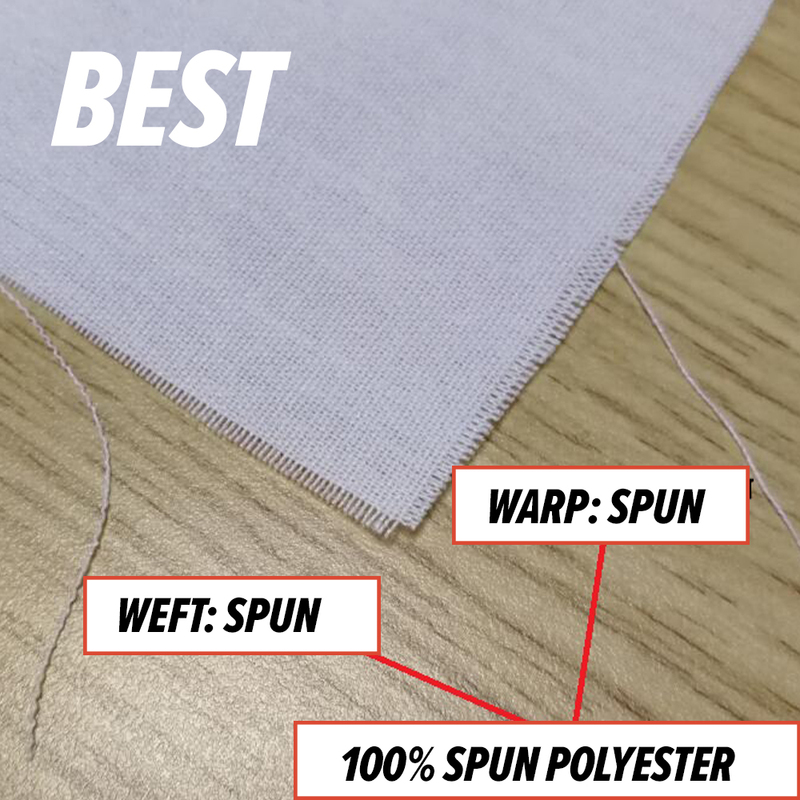 The dying process for spun poly is more involved as the dye must work harder to penetrate the yarn (this results in a more colorfast end product). As the yarn is stronger, more powerful, precise, Air Jet looms are used to weave better napkins. 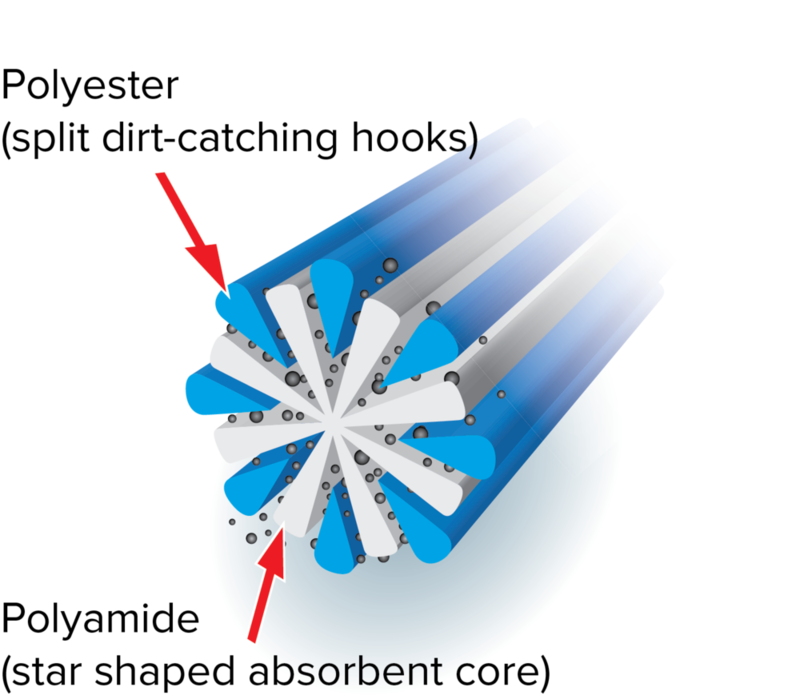 Filament Yarn is more like "Open End Yarn" and contains loosely (relative to spun) organized monofilaments pulling together in the same direction. Filament napkins are woven on cheaper (less complex) water jet looms. The dying process is quicker as color can more easily penetrate looser fibers. 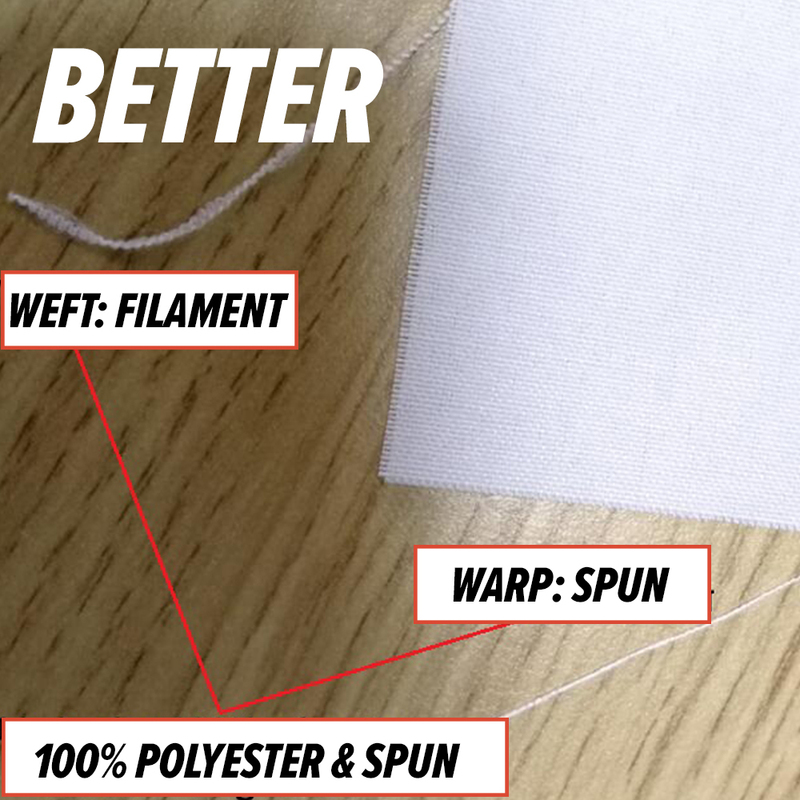 Filament yarn will feel more 'plasticy' and have more of a sheen than spun poly. While these napkins retain the core benefits of polyester napkins, the tradeoff is that the yarn is more likely to fray over time, which will compromise its structure causing color fading. This is what our laundry prospect was having to deal with, and why he switched to Monarch Brands. The middle ground. When combining spun poly with filament you mitigate color fading as spun yarn holds color and counters the perception of fading. These napkins are softer than Filament napkins and will have a greater lifecycle (if color matching is important). True spun polyester napery will be woven with spun yarn in both the warp and weft. Treated for softness, the napkin will feel more like cotton, but will benefit from being stain resistant, colorfast, and wrinkle-free. Fine-dining restaurants will use this napery, or use a cotton/poly blend (a story for another day). Monarch Brands carries 'BETTER' table linen, napery, and aprons. The combination of spun and filament provides a long-lasting fabric that holds up to the harsh environment of commercial laundries without breaking the bank. We also import ‘GOOD’ And ‘BEST’ when customer needs change. Good. Better. Best. 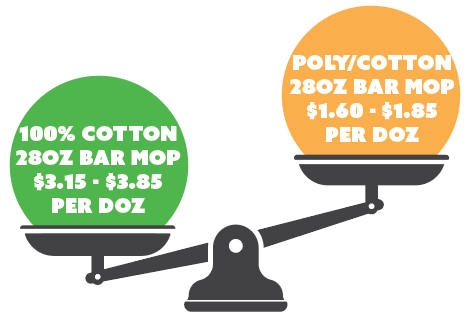 We have bar mops for every budget. These bar mops are perfect for wipe-and-toss in heavily soiled environments. Minor weaving defects such as over-stitching or imperfect cuts reject perfectly good wiping tools from circulation. We buy these at a deep discount and pass the savings on to you. These bar mops are made with recycled yarn so will grey and have a dingy appearance quickly. When bar mop production runs are over and inspections have been completed, mills may still have excess yarn, and a running loom. 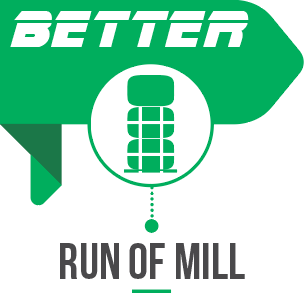 Run Of Mill (ROM) bar mops contain every bar mop that comes off the loom after the first quality run has been finalized, so are more economical than Grade A1 bar mops. Ideal for high loss environments. 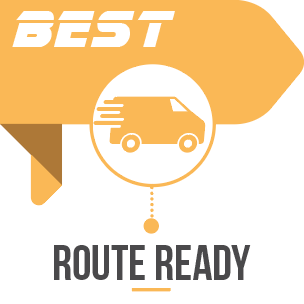 Route Ready bar mops are optically white and packed in bags of 25 so you never have to pre-wash or recount them prior to use. Typically, laundries save at least 70¢ per dozen by freeing washroom and finishing floor operators from a whole wash cycle, you gain production time to focus on other laundry room bottlenecks. Folded 25/poly, soft bale pack. Bright white, durable, woven labels. Looking for a great POP display item? Our most popular lines of bar mops are now available in attractive retail packaging so you are ready for online sales, walk-in impulse buys, and premium route-ready customers. 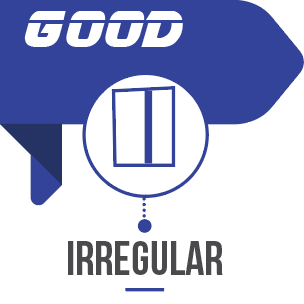 We think about what your customers are looking for, so you don't have to. Color-coded microfiber mops and cloths are essential for safe and efficient facilities maintenance. The rise of Healthcare Associated Infections (HAIs) is prolific amongst the elderly, sick, and young. The New England Medical Journal reports that in healthcare facilities alone 721,000 HAIs are reported annually contributing to 75,000 mortalities. Hospitals schools, daycares, nursing homes, and even the hospitality industry are implementing color-coded microfiber systems to combat this. What colors are used for each cleaning task? There is no defined answer other that you designate a specific color for a particular job. When I train a group, I try and use four colors in the wiping system and two colors in the moping systems. I try to make it as easy as possible to remember so that after a few days after implementing the program it becomes natural. Here are the colors I recommend designating for specific tasks but you can always change it to fit your plan. Yellow – Dry Dusting and polishing. Red – Restrooms area such as toilets and urinals, hazard areas. Blue – Glass, and mirrors. Green – General areas such as desks, tables, kitchens, sinks, water fountains. Red – Restrooms & hazard areas. Green – General areas such as classrooms, hallways, patient rooms. 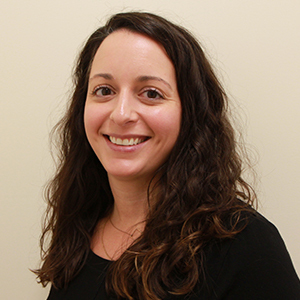 How do we prevent cross-contamination? Use a specific mop for each room. Unlike traditional cotton mops, microfiber flat mops take up little space and can be stacked so you may use a mop for every room. Never take the mop that we just used in the restroom and bring those germs out into the general areas and hallways. Clean the bathroom, take off the mop, put it in your laundry bag, and start fresh with a new mop as we move into a new area. This will make sure whatever the germs are in a particular area are contained. So why not just use a clean cloth or mop of the same color? I recently implemented a color coding system at a local university. I was explaining to the group you should never use a red towel outside of the bathroom. Somebody asked, "Why don't you just use a clean red cloth?" I told to the team that you may be using a brand new clean red cloth to clean a water fountain in the hallway, but a person may have just seen you using a red cloth cleaning a toilet or a urinal. We don’t want the person that is observing the situation going to your supervisor complaining that you used the same cloth to clean the fountain right after you cleaned the bathroom. They have no idea you changed to a clean cloth and will assume the worst. We need to keep up the color coding procedure to ensure our customers that we are cleaning properly. I have done color coding microfiber training many times, and it’s not always easy breaking the employees cleaning routine. I hear comments like “you don’t know what it’s like cleaning 25,000 square feet a night. 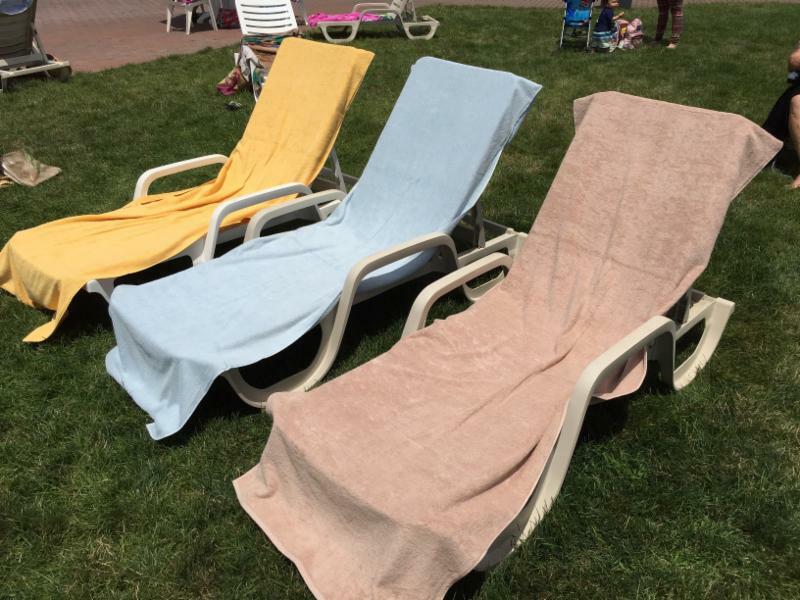 We don’t have time to worry about the color towels we are using.” As I try and sympathize for the employee, I explain the potential of spreading harmful germs from one area to another. I let them know as they get used to the system they will feel more comfortable and it will get easier as they break the usual routine. Eventually, the team will appreciate and embrace using new microfibers for each room. It's more sanitary for them too. Clean smarter, save lives. That should be the rallying cry of every aspect of your facilities maintenance team. What is grade 60 cheesecloth used for? We carry many grades of cheesecloth for many purposes. Grade 60 cheesecloth is the most widely used cloth… in the manufacturing of cheese. When I started in this industry 33 years ago, I had a fascination for cheesecloth. I needed to learn as much as I could. I went to several manufacturing plants to actually see what they did and was also blessed with wonderful customers sending me pictures of their finished product. Grade 60 Cheesecloth is a gauzy, lightweight, woven 100% cotton fabric with tiny holes that allows air to flow through the fabric. The count of threads per square inch is 32x28. This is considered a medium to tight weave and is the most popular of grades. Cheesecloth is available in several different grades, from open to extra-fine weave. Grades are distinguished by the number of threads per inch in each direction. In future posts I’ll tell you about the uses of each of the popular constructions. It's not just a name. Cheesecloth is really used to make cheese. This type of fabric started being referred to as "cheesecloth" because cheesemakers realized that it protected cheese but also allowed it to breathe while it aged. For this reason, cheesecloth is wrapped around some types of wheels of cheese while they age. Ex. : Locatelli, Parmigiana Reggiano, Cheddar, etc. My mother who was born in Italy, is the one who taught me about wrapping the hard cheeses in cheesecloth many years ago, she then put it in a brown bag and stored it in our second refrigerator in the garage. This lets the cheese breathe and helps it maintain moisture after cutting big chunks off the wheel to grate. The primary use of Grade 60 Cheesecloth is in some styles of cheese making, such as Ricotta cheese (well, technically, ricotta is not a cheese at all, but a cheese by-product. Its name, ricotta, means cooked again, an obvious reference to the production method used to make it. Where it is used to remove whey from cheese curds, and to help hold the curds together as the cheese is formed.) Also in manufacturing of Goat Cheese, Farmers Cheese, Paneer etc. Other uses of the grade 60 are: straining stocks, custards, thickening yogurt, making tofu & ghee. 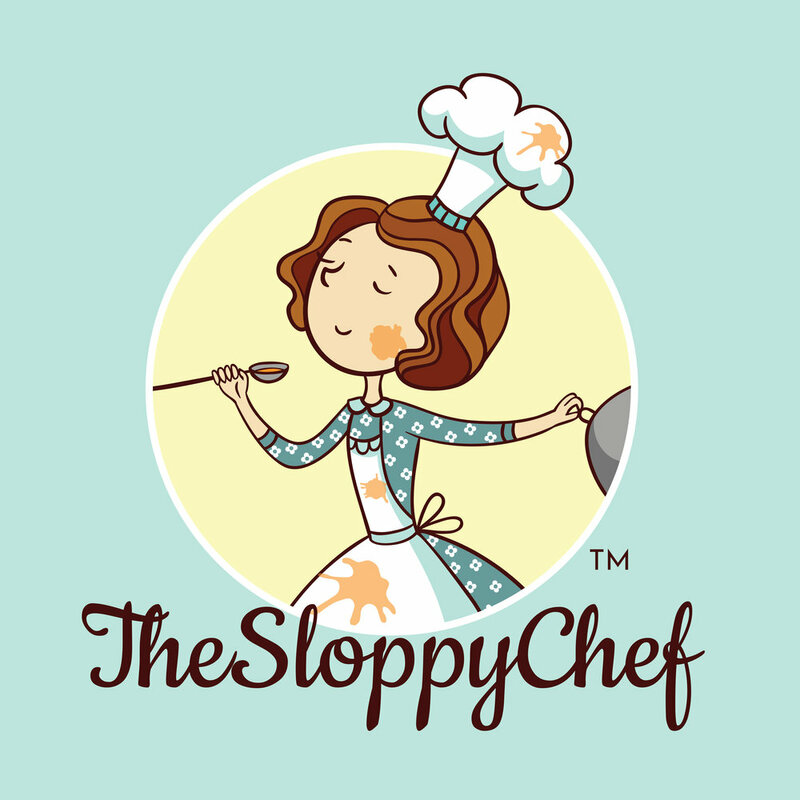 Saucy dishes like braised short ribs or oxtail stew starts with a good stock and a good stock starts with the seasoning—a sachet or a bouquet garni. They are both bundles of cheesecloth stuffed with herbs and spices and used to season soups, stews, and stocks. The bundle is tied with butcher's twine to a handle of the cooking pot, allowing for easy removal from the finished product. A sachet differs from a bouquet garni in that the latter only consists of herbs, usually parsley, thyme, and bay leaf. Grade 60 cheesecloth could also be used to cover Berry Bushes. I was told by a small farmer that he would cover the bushes as they grew to help prevent the bugs from eating the berries without having to use pesticide. As you can tell the list for grade 60 cheesecloth goes on and on, from straining apple cider, wine, and yogurt, craft projects, even staining and painting. It’s even used in the Federal Reserve. Here’s a little crafty idea! My sister-in-law being a big Martha Stewart fan was watching a holiday show and called me immediately to bring home cheesecloth. With Christmas Eve approaching and as always we do the traditional seven fishes, we had to dress up our place settings. We cut approximately 8 inch squares of cheesecloth, took ½ a lemon and tied it together making a pretty raffia bow. One went at each place setting and nobody needed to be concerned with biting down on a lemon seed. Ouch! What makes a salon stylist towel bleach safe? How is it that we can carry bleach safe salon towels when beauty salons are more damaging to towels than any other environment? Many products used in the beauty industry contain harsh bleach chemicals to help strip out color and remove polishes. Regular towels turn white with any contact with bleach, but bleach-safe salon towels remain color fast (even when you pour a cup of bleach directly on them. Pigment Dyes - Pigment dyeing is mostly used for printing, painting or spot dyeing. It normally comes in powder form and to make it to liquid form, it needs to be mixed with a binder (vehicle) a relatively neutral or colorless material that suspends the pigment and gives the paint its adhesion. Fiber Reactive Dyes – It is the most common method of dyeing. Today retail towels that are not subject to commercial laundering are often made with fiber reactive dyes. There are various production methods for this type of dyeing – e.g. cold pad batch dyeing, winch dyeing, vessel dyeing. Two or three different chemical compounds are mixed to develop fiber reactive dye stuffs which can be washed up to temperatures of 140°F. Vat Dyeing – Vat dyeing uses special Vat dye stuffs which have a different chemical structure than regular Fiber Reactive dyes. They are the primary choice where the highest degree of fastness to industrial laundering, weathering, and light-exposure are required. Vat dyes can be classified into four main groups (below) based on the temperature, amount of caustic soda, hydrosulphite, and salt used in dyeing. IN Dyes require high temperature, and a large amount of caustic soda and sodium hydrosulphite. IW Dyes require medium temperature and a medium amount of caustic soda and sodium hydrosulphite with salt added. IK Dyes require low temperature and a small amount of caustic soda and sodium hydrosulphite with salt added. IN Special Dyes require more caustic soda and higher temperature than IN dyes. “IN” above stands for Indanthren dye which is used for our Bleach Safe towels. Towels can be washed at maximum temperature (212°F) without losing color and have a high degree of color and washing fastness. See the below comparison of how Vat dye and Fiber Reactive dyes respond to a cup of bleach. In the end the choice is yours. Spend more up-front to buy a towel that will last longer, or buy a cheaper towel that you may have to replace more quickly. Is there a difference between microfiber cloths? Not all microfiber cloths are created equal. In recent years many manufactures have tried to imitate the microfiber technology, looking for ways to reduce costs. This has resulted in a compromise of quality industry wide. While these products initially seem similar they are not and will perform as well. Prices for microfiber cloths are directly related to the quality of the product as well and are generally based on the polyester/polyamide blend. These inexpensive microfiber products will have very poor absorption and scrubbing qualities. There are many microfiber products currently on the market, making it difficult for consumers to determine what the difference between one product and another. In order to get effective cleaning results from your microfiber cloths, it is important to make sure you know which ones to buy. Microfiber is 1/16th the width of a human hair. Microfiber used for cleaning should be less than 1 denier or decitex per thread. The type of denier for these microfiber cloths is an important feature to understand the quality thickness and best cleaning performance for the products durability. High quality microfiber used for cleaning should be smaller than 0.5 denier. The yarn used for our SmartChoice Cloths is 160D/72F and after splitting, DPF will be 160/72/9=0.25 denier. This is the finest split available in the microfiber cloth market. Q: How can you tell that your cloth is less than 1 denier thick? A: You really can’t with the human eye. It’s a question you have to ask your distributor. Research shows that it is the amount of splits that determines the quality of the microfiber. The splitting process breaks down each fiber into a very thin strand, estimated to be 1/16 the size of a human hair. Q: How do you determine if a cloth has been split? A: Rub the palm of your hand across it and if it catches slightly on the surface of your hand it has been made with split yarns. Another way to tell is to push a water spill with it. If the microfiber pushes the water instead of absorbing it, then it’s not split. You should be mindful, that a thick fluffy towel with a little bit of nap on it may feel softer and may appear to be a better product, but it is not. Better microfiber cloths are actually tighter, more tightly woven, which makes them feel stiffer. Test the cloth by holding it up to the sunlight, stretch the cloth and if it is a tight weave and you don't see a lot of sunlight, it's a high quality cloth. If it stretches easy and you see a lot of light, it is not a high quality cloth. Our SmartChoice cloths are great example of a high quality cleaning cloth. While they may appear similar at first, compare the quality yourself. Q: How will I know that a microfiber cloth is of good quality? A: Conduct research and consider this basic test. Take hand lotion and rub it on a mirror. Look at the number of passes it takes to remove the lotion — the Smart Choice cloth will do it in one or two passes. No matter the thickness of the cloth, there are a couple things you should look for in microfiber cleaning cloths. Q: There are many sizes of microfiber cloth, which one is right for me? A: A microfiber cloth should be large enough to be folded four times. This allows for cleaning several different surfaces by unfolding and re folding the towel with the clean side exposed. Q: How can I tell that a microfiber cloth will last a long time? A: Heat sealing around the perimeter of the cloth is another valuable feature, since it will help the fabric to withstand multiple washings. Recently automated machines have taken over to cut and sew the cloth hems. While quicker, they do not heat seal the edges, which shorten’s the life of the cloth. Read More About This. Q: What is the ideal yarn-type for cloth construction? A: The cloth should have at least 80 polyester/20% polyamide blends. The polyester is the scrubbing fiber and the polyamide is the absorbing quick drying fiber. In the end, the old adages “You get what you pay for” and “it looks too good to be true” still pertain. Before considering a plush low priced cleaning cloth do your research and conduct some test. It may not be the right cloth for you. Why are my microfiber cloths unravelling? How do you make sure your microfiber cloth won’t unravel? China has been the main source of microfiber cloths over the last ten years and as a country has a completely vertical manufacturing process. That being said, the labor rates from 2005 to 2016 have tripled in China and are now higher than most every major Latin country. In addition to increased wages, Blue Sky laws in China enforced by the Ministry of Environmental Protection have implemented greater restrictions on dye houses in China forcing increased pressure on pricing. As market pressures are pushing pricing higher, manufactures who are selling microfiber on a large scale have automated their highest labor component of microfiber cloths, assembly. Automatic stitching machines like the one seen in this video eliminate the need for sewing operators and help suppress cost increases. Here’s the problem, the automated machines cut the hem threads with a cutting tool (essentially a knife) leaving the threads cut short against the cloth (see video on right). The edges are then left exposed and susceptible to fraying. In a household setting this might not be important. In a commercial setting, it’s a “budget buster”. The concept of washing cloths hundreds of times is gone because the hems on these cloths will fall apart rendering the obsolete. Heat sealing the edges of microfiber cloths has always been done by hand. Essentially a department in a microfiber factory has workers touching the sewn edges to a hot wire which melts the hem starting a stopping point together (see video on right). This creates a seal that locks the stitching together, allowing the cloths to withstand hundreds of washes without falling apart. The process is remedial but critical to create a cloth that doesn’t fall apart! There is a difference in price. Automated machines have helped maintain lower costs on cloths and have been accepted as a common wiping tool in household settings. Automating the sewing of microfiber cloths have certainly aiding in maintaining retail friendly price points for cloths. Commercial users are accustomed to edges that last for up to 500 washes. If you are using a household grade cloth in a commercial setting, you’ll see cloth edges falling apart after just a couple uses. The additional 4-8% upfront cost for a heat sealed edge is inconsequential if the the cloths last 20-30 times longer. If you’re not getting the life expectancy out of your cloths, check the stitching first and look for a commercially heat sealed product. 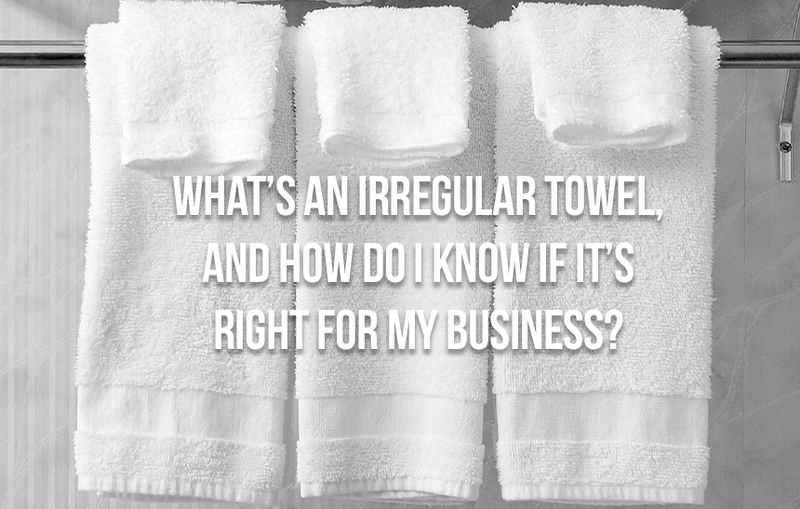 We carry slightly irregular wholesale towels for savvy customers who value... well, value. These textiles are sourced from high-end mills around the globe. Savings on these will vary from 20-40% of first quality equivalents. We buy irregular towels on an “open order” basis. Which means as soon as irregular towels are generated we get the call to collect. This gives us purchasing power to bring value-driven items directly to our customers. Oversized: 14lb/doz 30" x 68"
This 16 Single ring-spun Loop towel with brand name recognition will be arriving next month. We must have the order in hand to guarantee your spot. We're adding new towel lines and need your help to decide which styles to make. All towels are black and white at the moment, we'll get to color later in the process. Please vote YES or NO for each towel style and we'll create your favorites! Is there a difference between wholesale white towels? Yes, and picking the right textiles for the right situation will determine how successful your linen program is. Budget - Pretty straightforward, what is the maximum budget have you assigned towards ongoing textile purchasing? Aesthetics - How vital is softness, brightness, absorbency to you? Are operating a high-end luxury resort, motel, campsite, or a federal facility? Durability - If you operate in a high linen-loss environment durability may not be a chief concern. However, if you plan to work the textiles harder, you will need a stronger alternative. 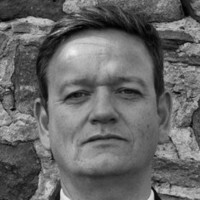 Every contributing factor is further complicated by manufacturing considerations. The weight of the towel determines how plush it feels. The yarn construction (ring spun vs. open end) is a factor that helps determine the strength. For example, ring spun cotton yarn is more expensive, made from long staple cotton, and thin enough to be wound like a suspension bridge cable to create strength. The makeup of the towel 100% cotton vs cotton/poly blend is determined by the color of the towel, longevity, and guest perception. Shipping carton vs. bale also contributes to the decision. Carton-packed towels are more expensive. However, they are guest-ready so avoid the initial wash-cycle (alleviating laundry bottlenecks). Bale packed towels will need washing before use as they are compressed for freight efficiency. We sell the same towel lines (Pearl & Apollo) both ways because customers have asked for them both ways. Cheap & Soft - Not So Durable. 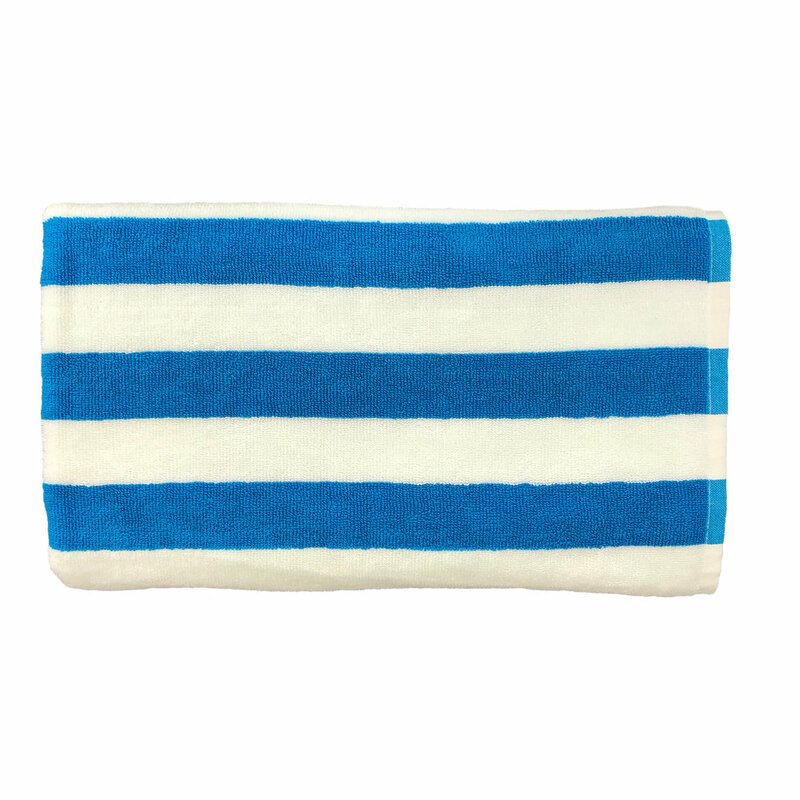 This towel may not be the most durable, made from 100% cheaper open-end cotton which doesn't hold up to as many washes. Durable & Soft - Not So Cheap. The best guest towels are heavy, durable, and soft. Made from 100% premium cotton with fancy borders, double hemmed for durability. Cheap & Durable - Not So Soft. Low-pile lighter towels made with a poly/cotton blend for prisons, and federal facilities, these towels get the job done... but just about all they will do. The best way to figure out what you need is to allow us to understand where you're coming from, and make recommendations. We have done it for major institutional catalog companies and small linen rental facilities. Start by picking up the phone and contacting us 215 447-7125. 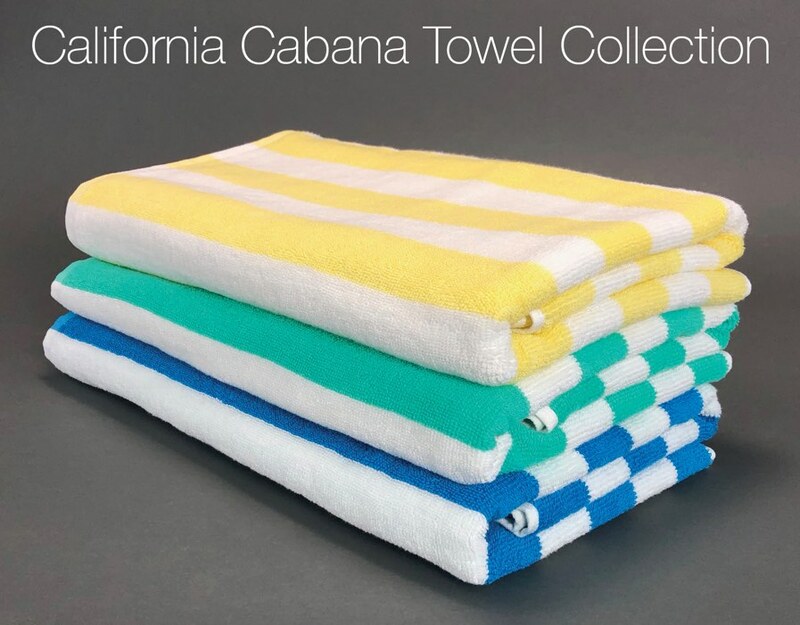 Size: At 30”x70”, this cabana towel is fits the specification of national resort hotel chains. Weight: 15lb/doz to absorb more than the average towel. Construction: 100% 20/2 ring-spun cotton gives the towel a retail appearance, while delivering commercial performance. Color: Yarn-dyed prior to construction. This vibrant collection won’t fade away soon.